Introducing The Quartz Creek Ranch Series! It’s the book birthday of Kiersi Burkhart and Amber J. Keyser’s four book Quartz Creek Ranch Series! 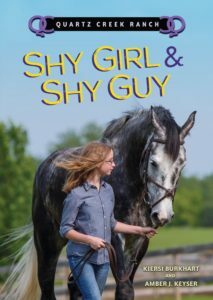 I’ve been so excited about these books because, despite the fact that I haven’s physically been on a horse since the 1970s, I have always loved books where horses were central to the plot: The Black Stallion, National Velvet, Jill’s Gymkhana. All were favourites growing up. Now thanks to Kiersi and Amber, I get to add four more horse books to my bookshelves! Before I share the short interview I did with these talented authors, how about a little background? KIERSI BURKHART grew up riding horses on the Colorado Front Range. 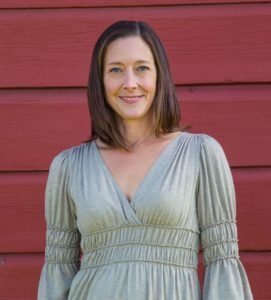 At sixteen, she attended Lewis & Clark College in Portland and spent her young adult years in beautiful Oregon—until she discovered her sense of adventure was calling her elsewhere. Now she travels around with her best friend, a mutt named Baby, writing fiction for children of all ages. AMBER J. KEYSER is happiest when she is in the wilderness with her family. Lucky for her, the rivers and forests of Central Oregon let her paddle, hike, ski, and ride horses right outside her front door. 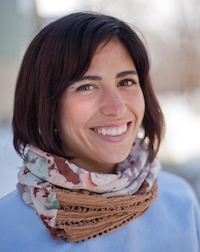 When she isn’t adventuring, Amber writes fiction and nonfiction for young readers and goes running with her dog, Gilda. I’ve never collaborated with someone on a book before so I’m dying to know what it’s like! How and why did you decide to your books together? What was the writing process like? Was it easy to agree when you were ready for submission? Kiersi: This has been anything but a traditional publishing journey for me. Before QUARTZ CREEK RANCH, Amber and I were just writer buddies. 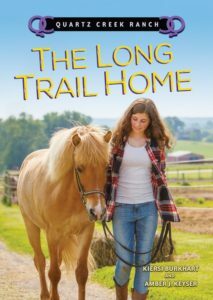 One day, I was Tweeting about an experience I’d had rehabilitating a horse when I was a tween, and Amber said, “I didn’t know you were a horse person!” She approached me with the idea of writing a Middle-Grade series together about horses. I agreed, of course, because I was hooked on the Misty of Chincoteague books as a kid, and loved the idea of writing some myself. We sat down one day and brainstormed the whole thing in a single sitting, then wrote some sample chapters. Her agent signed me a few weeks later, so now we’re agency sisters! We sold the books to a European publisher on the chapters alone, so then we had to sit down and write after the deal was made. But co-writing with Amber was super easy, considering we share a brain! We decided to alternate taking the lead on a single book—we came up with concepts and plot lines together, then one of us would write the first draft while the other would read and critiqued it to make sure we had written the characters consistently and in the same voice. Amber: Everything about these books has been love-at-first-sight! It was as if Quartz Creek Ranch and Ma Etty and Willard were waiting for us behind a secret door. All Kiersi and I had to do was find each other and the door swung wide. One of the most amazing things about the process is that we never had a single moment of conflict during the two years we’ve spent writing four books together! What’s the one middle grade novel you’d take with you to a desert island? Kiersi: THE NEVERENDING STORY by Michael Ende. Ironic to the title, I could read that book a million times over. Amber: HATCHET by Gary Paulsen. Appropriate for a survival situation and one of my favorite books of all time. How do you plan to celebrate your books’ launch? Kiersi: Since we live in different places (Amber’s in Oregon while I’m in Wyoming), we’re planning separate launch parties. Which would be sad, except that it means we get to double our reach! 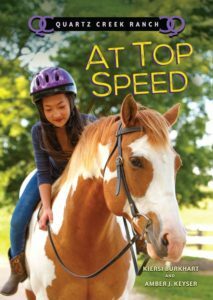 Amber: My daughter and her horse-riding friends are planning a launch party at a Roundabout Books in Bend, Oregon. There will be cupcakes! There will be horse trivia games! So here’s my dream dinner: you can host a dinner party and invite six middle grade authors (living or dead). Who would you invite and why? Bonus points if you tell me what you’re cooking for them! Kiersi: My choices would be: Michael Ende, Marguerite Henry, R.L. Stine, K.A. Applegate (just Katherine, though—very important), Catherynne Valente and Christopher Healy! I probably would be too star-struck and nervous to speak to Michael, but I’d have him there just to absorb his genius from a distance. And R.L.—I know he’s very funny on Twitter and I imagine he is in real life, too. I’d want to show Marguerite Henry what we made… I think QUARTZ CREEK RANCH would make her really proud. And Katherine, I know, loves animal books! Catherynne’s imagination simply inspires me—and Christopher Healy has taught me a ton about Middle-Grade humor and absurdity. I’d cook a lovely vegetarian dinner, just to suit everyone’s tastes… probably potato leek soup! 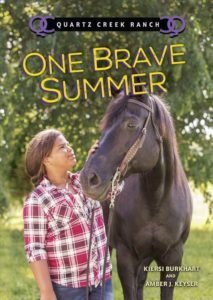 Kiersi: I personally have two YA novels in the works right now—and then I’m hoping to get back into Middle-Grade and write another horse book (in the vein of Black Beauty), or a book about dogs. I adopted my first dog about a year and a half ago, and I want to spend more time exploring the wonderful, magical bonds between children and animals. Amber: I have two nonfiction projects in the works, one is a history of marriage, and the other is a history of women’s underwear. I’m also launching a YA novel in April. Busy times!